Book Reviews and Promotions: Get Vic: Double Trouble for free today! Vic: Double Trouble brings you the beginnings of Vic Challenger in the first and second books of the series. 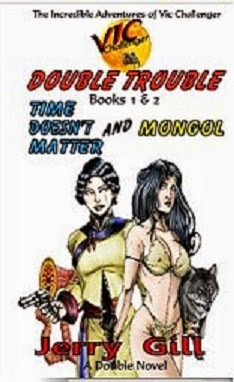 Time Doesn’t Matter and Mongol will take you on a journey far from life's comforts and pleasantries and into a world of unrelenting danger and savagery that will make your heart race. Working as a travel adventure writer under the pen name Vic Challenger, Victoria Custer travels the world seeking her eternal love from 1000 generations past. From Africa to the Yucatan to Mongolia, battling jungle predators mano a mano, facing off with mythical monsters and declaring war on slavers and war criminals, it's all just part of the journey. And this is just the beginning!